The UK’s offshore wind power capacity is set to nearly double by 2030, as a result of a new government initiative. Offshore wind has become an increasingly affordable source of clean energy due to plummeting costs. This, coupled with an increasing environmental awareness in consumers, is reinvigorating the focus on wind as a source of inexpensive, renewable energy. Wind turbines require fans to ventilate and cool several different areas to maintain and preserve the functioning of its equipment. These areas include the nacelle, generator, transformer, control cabinets, tower and inverter. Our fans for wind turbines are explained below. The generator is the core of the wind turbine. During the process of converting kinetic energy to electrical energy, heat is generated. Our supply partner, Rosenberg, have designed fans to be used as part of a generator cooling system. This provides the needed cooling load, safe operation, longevity and efficiency of the generator. Fan types DRA and AKF are ideally suited to this task. Heat generated in the winding of dry transformers must be dissipated over the surface of the coil. Rosenberg DKH and DKN fans help to extract the dissipated heat and simultaneously use the ambient air to cool down the transformer. Inverters are required to ensure that the generated current can be injected into the grid at a constant voltage and frequency. For cooling the inverter and sensitive electronic components, fans can be roof mounted or extract from the sides of the enclosures. This can be achieved with a combination of filter fans and exhausts or GKH and DKH fans for higher airflows. 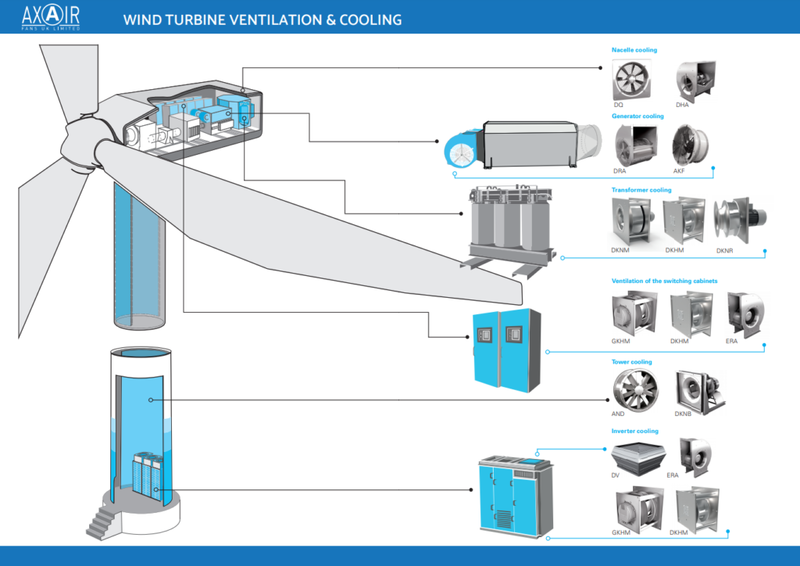 Depending on the construction of the turbine, the fan types suited to ventilation in the tower and nacelle areas are centrifugal plug fans or axial fans. The latter is available in a plate or cased housing. Please contact our team on 01782 349 430 or email sales@axair-fans.co.uk for more information on fans for wind turbines or to specify fans for your application. This entry was posted on Wednesday, March 20th, 2019 at 10:56 am and is filed under Applications, Environmental, Products. You can follow any responses to this entry through the RSS 2.0 feed. Both comments and pings are currently closed.